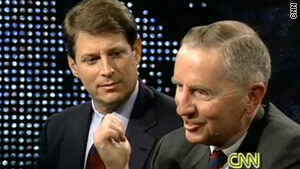 The NAFTA debate between Al Gore and Ross Perot in 1993 reached more than 16.3 million viewers. Right now on CNN.com, viewers can vote for the top 5 moments in "Larry King Live" history, as part of the show's 25th anniversary celebration. Here, Larry weighs in with his own personal favorite shows from the past 25 years. (CNN) -- 1. The NAFTA debate between Al Gore and Ross Perot -- It's an obvious choice for me. It changed history. Bill Clinton called the next day to say that NAFTA never would have passed without that show. So all things considered, I chose this for its impact and importance -- it had the largest viewership in cable history at the time. So that's why it's my number one. 2. Frank Sinatra -- He is, in my opinion, the foremost entertainer of the 20th century. And one of the hardest gets to get. And it was his last interview as well as a great conversation. 3. Marlon Brando -- He, like Frank Sinatra, was impossible to get. I think Marlon Brando was the foremost actor of his time. And as with Sinatra, it was just an incredible interview. Plus, I got a kiss out of it! 4. Mideast Peace -- Such an important show. Having three leaders -- of Jordan, Israel and Palestine -- on at the same time had worldwide relevance. PLO Chairman Yasser Arafat, King Hussein of Jordan and Israeli Prime Minister Yitzhak Rabin. It was worldwide diplomacy happening right there. How can you top that? 5. Ground Zero -- It was the worst thing to ever happen to the United States in modern history. Just getting to go there two weeks later, to walk among the rubble, to interview firemen and policemen, the first responders, to go to the burn center at the hospital, to see what happened up close -- it was living history. It is something I'll never forget.